Box Hill is a suburb of Melbourne, Victoria, Australia, 14 kilometres (8.7 mi) east of Melbourne's Central Business District. in the local government area of the City of Whitehorse. At the 2016 Census, Box Hill had a population of 11,395. Box Hill is notable for its significant population of people of Asian birth or descent, particularly Chinese. A large number of Asian restaurants and retailers in its shopping district contribute to the visibility of this aspect of the suburb's demographics. 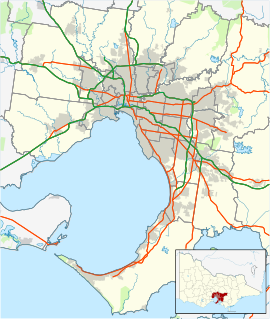 Box Hill is also a major transport hub for Melbourne’s eastern suburbs, with a substantial train station, the route 109 tram, and numerous bus routes serving the suburb. Frederick McCubbin's 1889 painting Down on His Luck was painted en plein air in Box Hill. He and other Australian Impressionists established the Box Hill artists' camp. Box Hill was first settled by the squatter Arundel Wrighte, formerly of Van Diemen's Land, who, in 1838 took up a pastoral lease on the land he had previously explored in the Bushy Creek area. The first permanent settlers, Thomas Toogood and his wife Edith, purchased 5000 acres (20 km²) in 1841 and Wrighte built a house on his property, "Marionvale", in 1844. The Pioneers' Memorial, which can be found in front of the town hall, is made from a chimney stone, taken from Wrighte's original house. It was not until after 1850, however, that Crown lands were subdivided and sold. Traffic along a main road running through the district encouraged the building of a hotel at Box Hill in 1853. Its owner named it the White Horse hotel and the name was bestowed on the road. Box Hill Post Office opened on 1 February 1861, being the first official use of the name. The postmaster proposed the name, derived from Box Hill, Surrey, England, near his birthplace. In 1871, Box Hill township's population was 154 and the district relied on orchards, vineyards and mixed farming. The extension of the railway line from Camberwell to Lilydale in 1882 included a station at Box Hill, but there were also stations at Canterbury and Surrey Hills, to the west. They attracted subdivisions and development ahead of Box Hill. Growth came, though, with a school opening in Box Hill in 1887 and the town became the seat of the Nunawading Shire Council, which met at the Box Hill Courthouse. In the mid-1880s, Box Hill became a favoured area for landscape artists who wanted to paint the Australian bush en plein air. These artists, among them Arthur Streeton, Tom Roberts and Frederick McCubbin, established the Box Hill artists' camp, and formed what would become known as the Heidelberg School, the first distinctively Australian movement in Western art. Unlike suburbs closer to Melbourne, Box Hill lacked the web of tramlines, which promoted residential development beyond the reach of the railway line. In 1916-17, tramlines reached the western edge of what in a short time would be the Box Hill Municipality, at Burwood, Mont Albert, and Wattle Park. The years after the World War I saw Box Hill's turn for residential growth. A girls' technical school was built in 1924 and a boys' high school in 1930. During the World War II a boys' technical school was opened. The new Town Hall on Whitehorse Road opened in April 1935. One of the arguments for its construction was that "the boon it would prove to the local brickworks, which had just resumed production after a period of suspension". The Box Hill Presbyterian (now Uniting) Church building was originally the West Melbourne Presbyterian Church built 1867 on the corner of Lonsdale and William Streets; a final service was held on 3 February 1935, following which the building was dismantled and re-erected on its present site, being opened in late 1935. After the end of the Second World War, Box Hill was suburbanised, but Box Hill South and Box Hill North remained comparatively undeveloped. Post war housing expansion included a Housing Commission estate in Box Hill South. A district hospital opened in 1956. The shopping area enjoyed growth and prosperity which, ironically, by the end of the 1950s was putting a strain on it; there was not enough space for parking. The development of Myer Eastland and Doncaster Shoppingtown in the late 1960s took trade away, and the shopping centre regained custom by undergrounding the railway line and station and building Box Hill Central on land, which included the old market. In 1954, the Melbourne and Metropolitan Board of Works designated Box Hill as one of five district centres for metropolitan Melbourne. The plan has succeeded in Box Hill. In addition to the shopping centre, the Box Hill TAFE and several office buildings have strengthened its centrality in the region. Apart from commercial functions there are large reserves, with ovals in three directions, about a kilometre from Box Hill Central. Box Hill South lies between Canterbury Road and Burwood East, about two kilometres square. Its proximity to trams was better than Box Hill North's and its residential growth was substantially pre and early post war. The Box Hill Golf Club is nearby and a linear park continues along Gardiners Creek. There are church educational institutions; Kingswood College (Anglican and then Uniting) and the Christian Brothers' Teachers' College and St. Leo's College (1952 and 1957). In 1971, a sister city relationship was forged with Matsudo, Chiba Prefecture, Japan. "Box Hill" is the name of a department store in Matsudo (ja:ボックスヒル). Box Hill has a shopping precinct. These range from the shops along Station Street and Whitehorse Road, to the suburb's two shopping centres. Centro Box Hill, formerly Box Hill Central is integrated with a bus interchange and the Box Hill railway station. The neighbouring Centro Box Hill (north section, formerly Centro Whitehorse). In late 2007, the two shopping centres merged. They are now known as buildings "South" (Formerly Centro Box Hill) and "North" (formerly Centro Whitehorse,) or "Box Hill Centro", with centre management located in the South building. Box Hill is also home to a number of recreational services, such as Neighbourhood Houses, a number of Scout Groups, including 11th Box Hill, Mont Albert North (formerly 10th/13th Box Hill), 6th Box Hill and 1st Mont Albert Scout Groups. The Box Hill Community Centre, located 1 km South of Box Hill Central, also provides a number of services to the local community. Box Hill Hospital serves Box Hill and its surrounding suburbs. Epworth Eastern, a private hospital, opened in 2005 opposite Box Hill Hospital. At the time of the 2016 Australian census, 35.5% of Box Hill residents are Australian born, the next largest place of birth was China (27.6%) (excludes SARs and Taiwan), then followed by Malaysia (4.8%), India (4.2%), Hong Kong SAR (3.0%) and South Korea (1.7%). 64.7% of resident's parents were both born overseas, while 21.9% have both parents being Australian born. 36.9% of residents only speak English at home, with Mandarin Chinese being spoken in 28.3% of homes. The next most spoken languages at home were: Cantonese 9.8%, Korean 1.7%, Hindi 1.3% and Vietnamese 1.2%. Self described non-religious people made up 46.3% of the population, along with Catholics (13.5%), Buddhists (7.8%) and Anglicans (4.5%) - while 10.1% of Box Hill residents did not state their religious incline in the census. Comparing this to Australia as a whole, Box Hill residents are much less likely to be Australian born or for both parents to be Australian born, and are more likely to have stated "No Religion" on the census. The suburb of Box Hill has several schools, including Box Hill High School, Box Hill Senior Secondary College, Our Lady of Sion College, and St. Francis Xavier's Catholic Primary School. For mature students, Box Hill Institute of TAFE and St Leo International College provide further education. There are two kindergartens in the area; St Peter's Anglican Kindergarten, and Goodstart Early Learning Box Hill. Schools in neighbouring suburbs include Koonung Secondary College, Kingswood College, and Roberts McCubbin Primary School. The Box Hill Hawks are a local Australian rules football club, playing in the Victorian Football League and are based at the Box Hill City Oval. This team was formerly known as the Mustangs, named for the city's mascot, the White Horse. They are currently affiliated with the Hawthorn Hawks. Another football team, The Whitehorse Pioneers, competes in the Eastern Football League. Box Hill United Soccer Club currently competes in the National Premier Leagues Victoria 2. The club also fields juniors and a women's team in the Victorian Women's Premier League. Box Hill Athletic Club, founded in 1932, survived through the war years and became powerful after the 1956 Olympic Games, held in Melbourne. The Club's original training ground was at Surrey Park, Elgar Road South, an area provided by the Box Hill Council. After several years of filling in and grading, the area known as Hagenauer's Park was made available for athletics. Box Hill has an 18-hole golf course, located at 202 Station Street. The course suits golfers of all abilities and new members are constantly being inducted. The club offers junior development programs. The senior pennant team took out the Division 5 VGA Pennant Flag in May 2008. In basketball, the Whitehorse Mustangs celebrated its 20th anniversary in 2009, having been formed when the North Box Hill and Surrey Hills clubs merged. The club fields junior teams each Saturday in the Eastern District Junior Basketball Association (EDJBA), with home games played at the basketball stadium of Box Hill High School. It also runs weekly social competitions for both men and women and fields a championship men's team in the Melbourne Metropolitan Basketball League (MMBL). The Box Hill Action Indoor Sports Centre also provides residents with dedicated facilities for indoor soccer, cricket and netball. Aqualink Box Hill (formerly Whitehorse Aquatic and Leisure Centre), run by Whitehorse Council, provides residents with an indoor and outdoor pool, basketball courts, a gym, squash and tennis courts. The swim club, Surrey Park, swim at Aqualink Box Hill. The club uses the facilities of Aqualink. The surrounding parklands include (aside from a large lake, now filled with water, but once used as a quarry) a baseball diamond, a football oval and cricket pitches. Box Hill Rugby Club play at RHL Sparks Reserve in the Dewar Shield competition. Box Hill railway station, viewed from platform four, looking east. Box Hill is a major transport hub for the City of Whitehorse and surrounding suburbs. Box Hill railway station is located under Centro Box Hill and is served by the Belgrave and Lilydale railway lines. The complex also includes a large bus terminus, linking commuters to a broad range of destinations across most Melbourne suburbs. Tram route 109, which runs along Whitehorse Road, was extended from Union Road, Surrey Hills, to Box Hill and opened in May 2003. It runs to Port Melbourne via the city. There are V/Line coaches that run from Melbourne (Southern Cross) to Mansfield, Victoria / Mt Buller. The Coach stop is opposite Box Hill Town Hall, on Whitehorse Road. Before travelling, tickets must be pre-booked at V/Line's website, or Box Hill railway station customer service desk. Tickets can also be booked from most staffed Metro or V/Line railway station. ^ "Postcode for Box Hill, Victoria (near Melbourne)". Postcodes Australia. Retrieved 9 November 2012. ^ a b c Lemon, Andrew (1978). Box Hill. Lothian Publishing. p. 173. ISBN 0-85091-064-1. ^ Lemon, Andrew (1978). Box Hill. Lothian Publishing. p. 201. ISBN 0-85091-064-1. ^ "109 Box Hill - Port Melbourne". Public Transport Victoria. This page was last edited on 19 April 2019, at 01:02 (UTC).